Full Moon Training Treats – What’s Not To Love? Ruby has never liked water – not the drinking kind, but the swimming and bathing kind. Although we knew that she would probably never be a dog that leapt into the waves, we always hoped that she would eventually grow more comfortable with the beach and water in general. We tried many things to change her mind, but hadn’t had much luck …until about two weeks ago when we tried Full Moon Training Treats. Quite simply, Ruby loves Full Moon Training Treats. She loves them so much that on a recent trip to the beach – she almost forgot she hates water (see video proof below). Full Moon’s new training treats are available in either chicken or duck. The treats are made from 100% human grade meat without any fillers, artificial flavors, or added junk. They are also made in the United States with ingredients from USDA approved farms. These treats are small in size (about 1/2 inch around and 1/4 inch thick), and with only three calories they are a great treat option for small to medium-sized dogs or those prone to weight gain. Full Moon Training Treats are soft, palatable, and virtually odor-free to humans. This is a big plus for me as I have a sensitive nose and dislike stinky pet treats. They are also light weight, making them easy to carry on adventures. Full Moon is a fourth-generation, family-owned and operated company of dog lovers. They specialize in healthy, all natural dog treats and their full line of products is available online as well as at Target and Walmart. A few Sundays ago (on my birthday) we decided to put these treats to the test with a day trip to the beach. We did some hiking and then had a picnic. Our goal for the day was to see if Ruby would join us for a walk along the shore and maybe (just maybe) dip her paws into the water without getting super stressed. With the help of a few of these delicious treats, lots of reassurance, and positive reinforcement – she accomplished this goal. The treats made a great incentive and the low caloric count meant we could give her a few extra rewards without worrying about weight gain. Seeing Ruby relax at the beach was pretty much the best birthday gift of all! 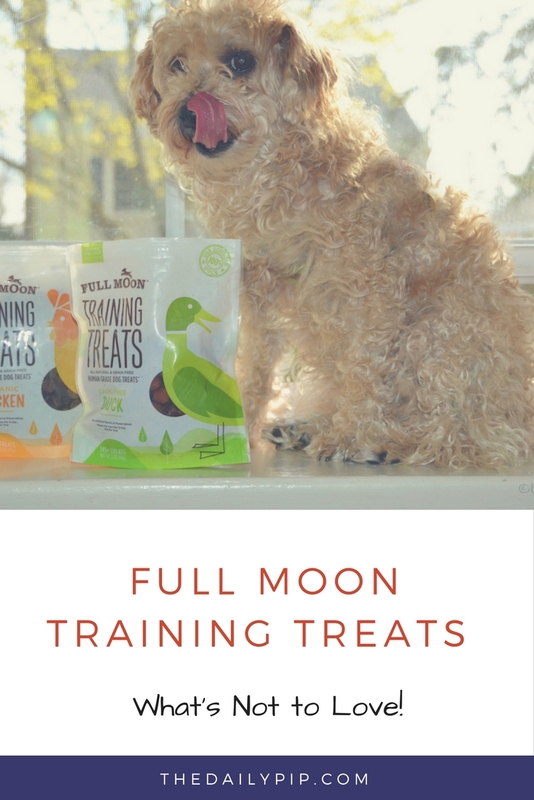 We give Full Moon Training Treats four enthusiastic paws up! This post is sponsored by Full Moon. I am being compensated for helping spread the word about Full Moon’s new training treats. Full Moon is not responsible for the content of this post. How wonderful for you, Ruby! Those must be really tasty treats! I wonder if those treats would help Hailey with the water as she feels the same as Ruby. Look at you, Ruby! Great job! These must be some very tasty treats. Awww Ruby! So glad you love these new treats that can keep your body looking poochie perfect! I like that they are odor free! I always wondered why so many treats smell so horrible! Oh yum, that looks delish!Your Pals,Murphy & StanleyPS – Tip: Act kinda dumb and see if you get more treats BOL! Those must be some tasty treats!!! Ruby, my adventure kitties Sophie and Kylo Ren can totally sympathize with your dislike of the water. I tried taking them out on the beach one time, and they hated it. Perhaps we should tempt them onto the beach with these treats! MOL! These treats sound great–the lack of smell is definitely a bonus for me. I wonder if my guys would like them well enough to get them to start barking at the neighbors and the mailman lol. They MUST be good, if you can get in the water like that! Awesome treats! ALL dog and cat treats should be human grade! I want to almost mistakenly eat it myself. Those treats sound perfect for my gang! Ruby is so cute and I hope that she starts enjoying the beach more. I love having duck as a training treat. Dogs and cats usually really enjoy them. Great job on your training. That's some good yum pretty Ruby! I didn't have to be trained to like treats, I liked them right off! They sound great! Love that it's a family owned company. We love Full Moon and were so excited to see there smaller treats at Global! But, Ruby, no matter how much I love all their treats, nothing, I repeat nothing, will get me in the water. You are to be commended. Love Dolly Pees: Mom brought home a sample so we got to try them too! Hi Kris! Did you get my email about Ruby and Dolly's get together? I sent it a few days ago, I know you're busy just want to make sure you've seen it, or maybe it's in your spam folder. Thanks! Glad those treats are helping Ruby enjoy the water more. Treats that can get a water averse dog to wade are definitely special! Mr. N doesn't like getting wet either. We go nuts for these, especially the duck ones! I wonder if these would have worked with our beagle Kobi? He never liked the water either, but he sure loved treats. However, throwing them in our little pool would still not get him in there to cool off!